Don’t go just yet! 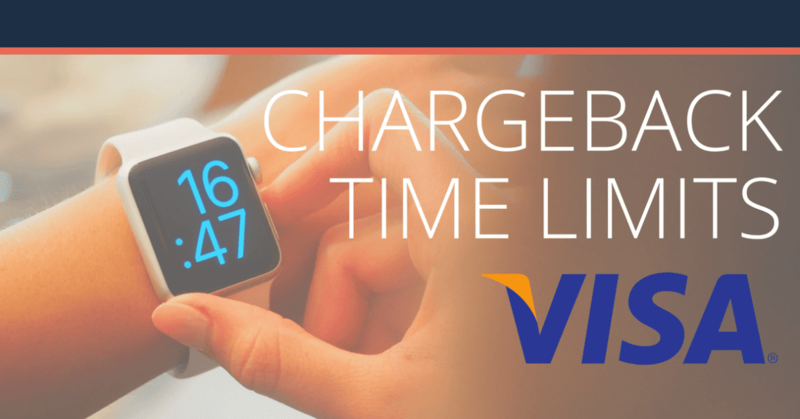 We need to know Visa’s new chargeback time limits. The world’s largest card network has different time limits for cardholders, issuing banks, acquirers. And that has changed since April 2018! But these’s new chargeback time limits are not set in stone. Reason codes with certain conditions can adjust certain timeframes. The circumstances can vary. And its details can be found in the tables below. The clock is ticking for your dispute response. Let’s see which parties are affected under which conditions. Visa’s time limits are outlined by its reason codes. And the Visa Core Rules and Visa Product and Service Rules further influence the workflow. You can learn more about the Allocation and Collaboration workflow right here. Chargeback time limits are when chargebacks must be processed (and resolved) within the specified time frame. The time limits begin on the calendar day following the transaction processing date. After that, you’ll need to write a compelling response to the issuer. You’ll also need to provide proof of innocence if the issuer favors the cardholder. This is a good time to review how to write the best chargeback response). The Visa Claims Resolution (VCR) initiative shrunk Visa's time frame and streamlined its dispute process. The chargeback time limits had changed because of the Visa Claims Resolution (VCR). These new time limits apply to Visa’s new VCR dispute reason codes. You can learn more about the VCR right here. Most chargeback time limits for merchants are set for 30 days. That means they’ll need to respond within 30 in order to challenge the dispute. Visa plans to have disputes resolved within 31 days. Here are come of Visa’s new dispute reason codes. It was created in part of the VCR. And it will be moderated by Visa Resolve Online (VROL). The chargeback time limits for cardholders will vary from one issuer to another. The time limits shown in their column is what was shown in Visa Core Rules and Visa Product and Service Rules. Merchants must know that their time limits has shrunk from 45 days to 30 days. You can click on each reason code in the left column to learn to assemble your response. Acquirers must process a dispute response within 30 calendar days of the processing date. And there’s another rule that Visa placed in the new VCR process. Issuers and cardholders will be given 30 days to respond to your rebuttal. This stage is called pre-arbitration. While the majority of reason codes have the same associated time frames, a handful of reason codes have conditions that can modify the time allotments. Reason codes with these modifiers are noted above with an asterisk (*) and described below. Keep in mind that the following information was extracted from the 2017 version of Visa Core Rules and Visa Product and Service Rules. The 2018 version is not yet available. But we connected the dots to show which modifiers match with the new VCR dispute reason codes. 120 calendar days from the last date the cardholder expected to receive merchandise or services. 120 calendar days from the date the cardholder was told that the merchandise or services won’t be provided. This time limit can start at the date the cardholder received the merchandise or services. This happens when the merchandise or services was purchased on or before the transaction processing date. It can also start at the processing date of the balance portion of the transaction. But that happens when there was a delay in the delivery. This time limit can start at the date the cardholder received the merchandise or services. And that happens when the merchandise or services were provided after the transaction processing date. Want to be knowledge about the card networks’ reason codes? 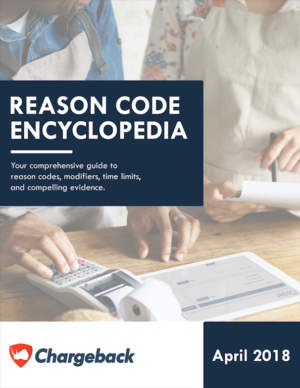 Download the Chargeback Reason Code Encyclopedia. You’ll learn about the transaction modifiers that affect each code. We also added an extensive brief on Visa’s new dispute process. Here’s your copy. The start dates are not the only thing you should worry about with VCR 13.3. There are more chargeback conditions that impact the time limits. VCR 13.3 chargebacks under conditions 1, 3, or 4 require the issuer to wait 15 calendar days when the cardholder returned or attempted to return the merchandise or cancel the services. Condition 2: This is for Card-Absent Environment transactions. The Merchant’s verbal description or other documentation presented at the time of purchase did not match the merchandise or services received. There is evidence in the notification of previous ongoing negotiations between the cardholder and the merchant to resolve the dispute. The negotiations occurred within 120 days of the transaction processing date. The chargeback processing date is no later than 540 calendar days from the transaction processing date. Condition 4: The Cardholder disputes the quality of the merchandise or services. A chargeback must be processed no later than 120 calendar days from the date the cardholder received the merchandise. It could also be processed 120 calendar days from the date on which the cardholder was notified that the merchandise was counterfeit. The chargeback processing date cannot exceed 540 calendar days from the transaction processing date. Condition 5: The merchandise was identified as counterfeit by either: the owner of the intellectual property or its authorized representative; a customs agency, law enforcement agency, or other governmental agency; or a neutral bona fide expert. There is evidence in the notification of previous ongoing negotiations between cardholder and merchant to resolve the dispute. The chargeback processing date is not later than 540 calendar days from the transaction processing date. Condition 6: The cardholder claims that the terms of sale were misrepresented by the merchant. The date on the credit transaction receipt. The date of the cardholder letter, if the credit transaction receipt is undated. The date the issuer received the cardholder letter, if both the credit transaction receipt and the cardholder letter are undated. Condition 1: The cardholder received a credit or voided transaction receipt that was not processed. The date the cardholder received or expected to receive the merchandise or services. Condition 2: The cardholder returned merchandise, cancelled merchandise, or cancelled services; the merchant did not process a credit or voided transaction receipt; the merchant did not process a credit; and the merchant did not properly disclose or did disclose, but did not apply, a limited return or cancellation policy at the time of the transaction. Condition 5: An advance deposit transaction where one of the following is present: the cardholder properly cancelled the advance deposit transaction but the merchant did not process a credit; the merchant provided alternate accommodations but did not process a credit; the hotel or cruise line did not inform the cardholder of its cancellation policy; or in a US domestic transaction, the merchant provided alternate accommodations or an alternate vehicle but did not process a credit. VCR 13.6 chargebacks filed under condition 6 must be filed within 120 calendar days from the transaction processing date. Chargebacks filed under VCR 13.6 must be processed within 120 calendar days from the date on which the cardholder cancelled the transaction. Condition 7: The cardholder properly cancelled an advance payment service transaction but the merchant did not process a credit. VCR 10.5 chargebacks under general conditions, in all regions except US domestic, must be processed within 120 calendar days. It has to be processed from the date of the identification by the Merchant Fraud Performance Program. There have been a lot of changes with Visa’s dispute process. That’s why you should consider automated dispute management and real-time resolution. Our new SaaS software is ready improve your win rate while lowering your chargeback ratio. That the Chargeback App can also integrate with your ecommerce platforms and payment technologies. It’s greatest feature is its dispute response generator. That means a response template will be generated whenever you receive an Alert. It’ll extract the information needed to create a compelling response. You’ll still have the option to edit it and add more information. Feel free to contact us to learn more about the Chargeback App. Or you can request a demo see for yourself how you’ll effectively handle dispute management. Also, feel free to bookmark the most resourceful articles from our blog.